If you are going through a painful breakup or divorce, you may feel like the life you once knew is crashing down around you. You need help to gather the pieces and 'rebuild' yourself from the ground up. Rebuilding features Bruce Fisher's 'divorce process rebuilding blocks,' a proven-effective, nineteen-step process for putting one's life back together after divorce. Now the most widely-used approach to divorce recovery, the 'rebuilding' model makes the process healthier and less traumatic for those who are divorcing or divorced-and their children. Over two decades of research and practice are combined with feedback from hundreds of thousands of men and women who have used the book on their own, or in one of thousands of Fisher divorce recovery seminars worldwide. 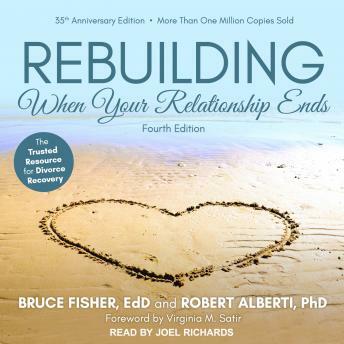 This book also includes Fisher's detailed Healing Separation model-the first of its kind to offer couples a healing alternative to the usual slide from separation to divorce. This fourth edition, revised with the assistance of psychologist and marriage and family therapist Robert Alberti, continues Bruce's tradition of straight-to-the-heart response to the needs of his clients and readers.